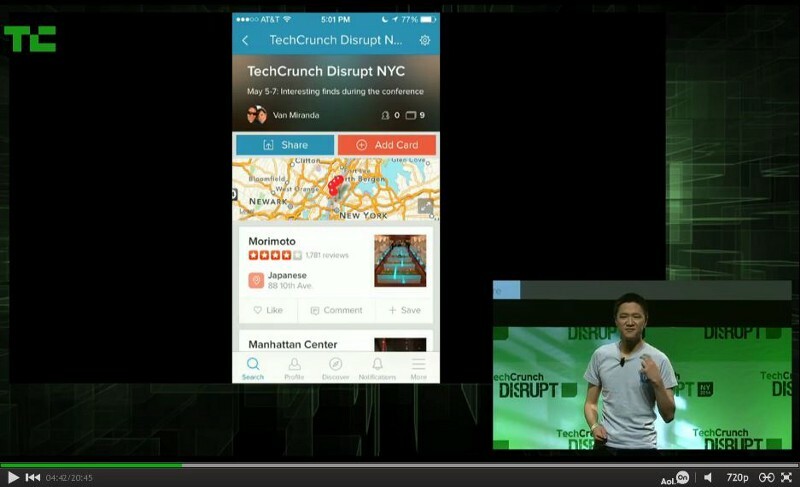 The winner of this year’s TechCrunch Disrupt New York is Vurb. First, please watch the start-up’s finalist pitch. Done? Impressed? I can see Vurb working on the web, though I’d be more comfortable saying that if I can try the service first. Unfortunately, Vurb is still in closed beta. Like Vurb, feecha is an aggregator, so there are insights I can share. They will inevitably face some of the same problems we faced. One of the biggest is that their interests are not aligned with many of their partners. Take Yelp for example. Yelp makes the majority of its money through advertising; that means Yelp needs eyeballs and engagement on their ads, which means Yelp needs users on Yelp. If successful, Vurb will take away from that, so Yelp is highly incentivized not to share its data. That is a big problem for Vurb. I can see Vurb working on the web, but it will have major challenges. I don’t see Vurb as is working on mobile. I will caveat that by saying I reserve the right to change my mind once I can actually try out the service. Based on the pitch, however, I’m confident it won’t work in its current form. Problem #1: People don’t like to type into search boxes on mobile apps. We had a search box on feecha and nobody bothered to try it. It’s not even about good results; people did not tap that search box at all! If you want to search for a restaurant, would you do it on Yelp or Vurb? With Yelp, it’s one step. With Vurb, it’s two steps. No contest. Problem #3: …it’s a bad user experience, because doing anything means having to open other apps. If that’s the case, what’s the point of starting with Vurb? 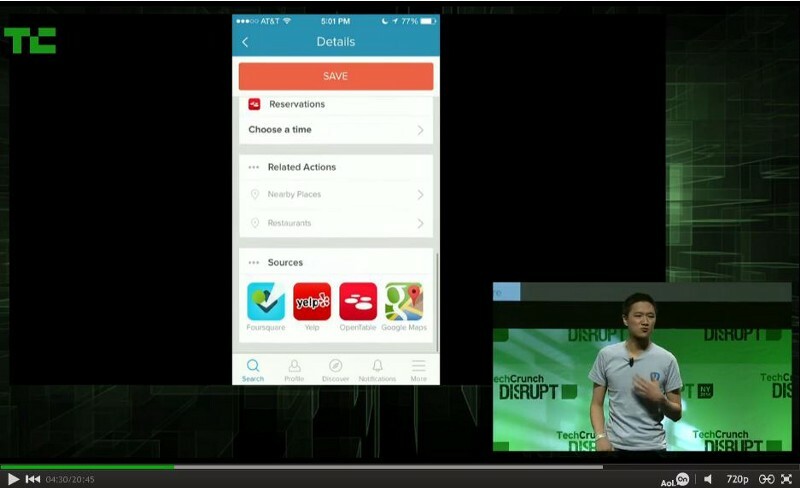 Deep linking helps, but those links only go one way. Vurb will link to Yelp, but Yelp won’t link back to Vurb. 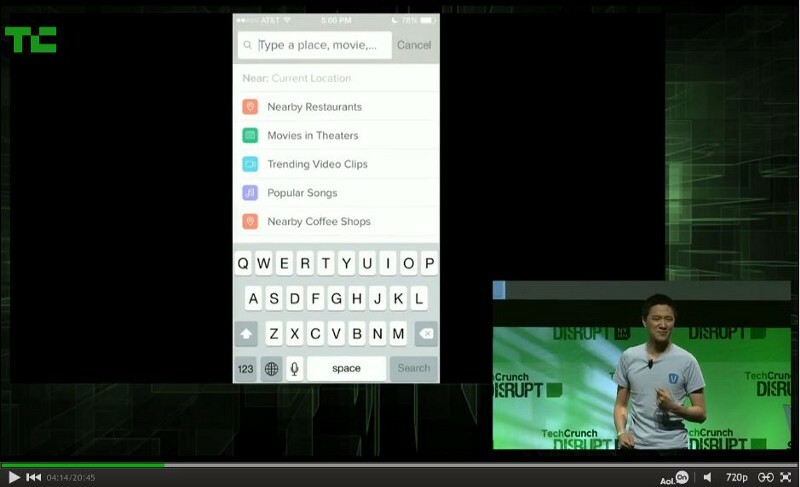 So for Vurb to justify its usage in say food, it will have to do search for food better than Yelp can do search for food. Good luck with that. So we have a mobile app with a primary input interface people don’t like to use (search box); limited information it can display (restrictive APIs); and a navigation that forces users to open other apps to do anything. Problem #4: The time people have for new apps is extremely limited these days; it’s a crowded market and moreover, we seem to be trending towards unbundled app services. Will an aggregator like Vurb get the attention, usage and social recommendation it needs to grow? I thought Vurb gave one hell of a pitch. The founder is a good presenter and was even better in the Q&A. Check out his answer to Marissa’s question at 09:17 in the video. “We will create new templates for new sources” was his essential answer, but instead it was dressed up in a mini-speech about cognitive overhead and design philosophy. He turned what should have been a boring, straightforward answer into a value proposition statement. I need to learn this! I will refrain from being just another armchair critic. I think the potential for Vurb on mobile is in its collection functionality, which I would make Vurb’s primary view on mobile. This can work because then Vurb is more about discovery than search, and here the value of aggregation becomes obvious. A collection needs to pull from many sources to be good, and it can provide “wide” answers (that span across different use cases) that specialized apps may not be able to. This is my roundabout way of saying that mobile aggregators are inherently more about discovery than search. That’s the conclusion we arrived at with feecha after much trial and error, and what we would advise to Vurb. what if you want to QUICKLY check out Foursquare AND Yelp’s ratings at the same time to see if there are discrepancies, or maybe it’s a venue only available on yelp for example… In this case, there’s no competition nor a faster way to do it than using Vurb, agreed?